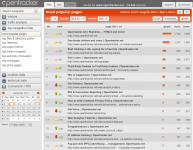 Most Popular Pages shows you all pages on your site, ranked in order of popularity, for any given period of time. Use the calendar to select your date range. The columns displayed, from left to right, are: No., rank, page title / url, graph (visual representation), visits, and views. The difference between ‘visits’ and ‘views’ is that visits indicates the total number of visits to your website which include a click on the page in question, while the number of views indicates the total number of times the page was viewed. For example, over 10 visits, a page might be viewed 17 times. The Rank column shows you if popularity has changed over time, using green and red arrows. You can select whether to view the page title and/or the url. A list of the all the pages on your website ordered by the number of times each page was viewed. The report is avalaible for any selected date range. The Most Popular Pages report is grouped together in the Top Navigation Lists.